I don't know about you but I always look forward to the start of every season & as much as I love blue skies & the warmth of the sun on your skin during the Spring & Summer I don't think you can beat the arrival of Autumn. For me it's the promise of fresh crisp days & (hopefully) blue skies to accompany darker nights that are just perfect for snuggling in front of the fire with the odd lit candle or two. To mark the arrival of Autumn The White Company have just released a new fragrance to their home collection called 'Autumn', which they describe as a 'glorious warm scent which blends fruity notes with musk and amber'. I've been lucky enough to have been sent one of their candles to try & I have to say it was love at first sniff! Funnily enough I had been discussing candles on holiday with my hubby (as you do!) & despite the fact we've got many a candle (both wax & battery operated) together with fairy lights dotted around our home we've not brought a scented candle for a few years & whilst basking in the Mallorcan sunshine I had decided that this Autumn I would invest in a few, not only to light but to also lightly fragrance our home as well. So the arrival on my candle from The White Company was perfectly timed. One of the first things that struck me, apart from how beautifully it came packaged (I just love brands that box & wrap their items to give that luxurious feel) was that I could smell the scent of my candle from the moment I undid the cellophane wrapping around the box. Now I can be quite sensitive to scents as some can trigger migraines but whilst this candle's scent is quite sweet it does have the spicy undertones from the musk that balance it well & is definitely a fragrance I would have chosen for myself. I received the Autumn Signature candle which is priced at £20 (although you can currently get 15% off with code AN536) & has a burning time of approximately 28 hours plus of course even when not light the scent from the candle helps scent your room so it's not bad value & of course as with all things from The White Company it has a gorgeous elegance that will add style to any room. 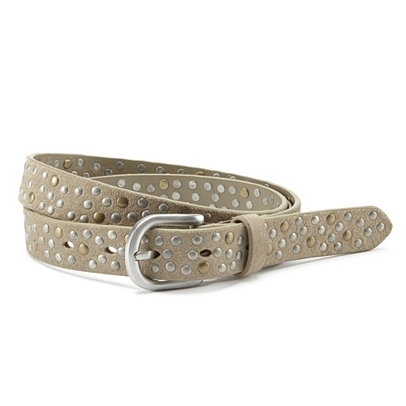 So first up is this lovely studded suede belt. I recently bought a similar belt in their summer sale & have already found it incredibly useful. Teamed with just the simplest of outfits such a white shirt & jeans this belt will transform any look & will end up being something you wondered how you lived without. 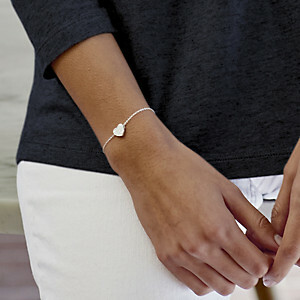 Now I've had my eye on this lovely heart bracelet for a while. Perfect for wearing on it's own or layered with others I think this would make the most perfect gift & keepsake. Of course come the arrival of Autumn & we'll all be wearing many a scarf. So this pom pom edged knitted light grey one would be perfect for layering over a biker jacket come those cooler mornings. 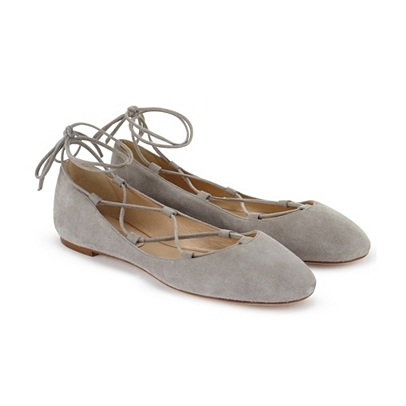 And these light grey suede lace up ballet flats are another game changer for adding interest to a plain & simple outfit. I just love the look of this lace camisole - so much prettier than some of my plainer numbers for adding a layer on warmth. I'm not sure how warm this would be but it would certainly feel very luxurious to wear this under knitwear. This next item I've already purchased a couple of months ago. Perfect for rolling up & keeping in my handbag & using when out shopping & of course being from The White Company incredibly stylish too. 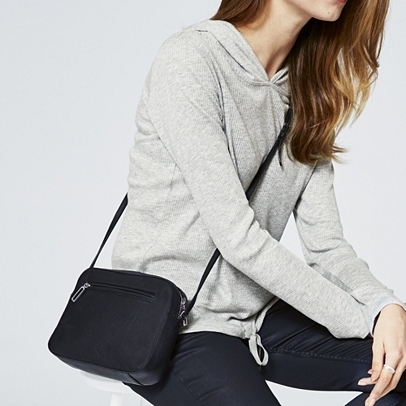 Next up a timeless double zip across body bag that is perfect worn as it is or accessorised with a tied scarf or pom pom. And finally how cosy does this blurred herringbone coat look? In fact the whole outfit is perfection & definitely a colour palette I intend to continue with this AW16. Back to today's outfit & I'm teaming an embroidered H&M top with my ever useful cigarette jeans & tying in the black embroidery with my Marks brogues. 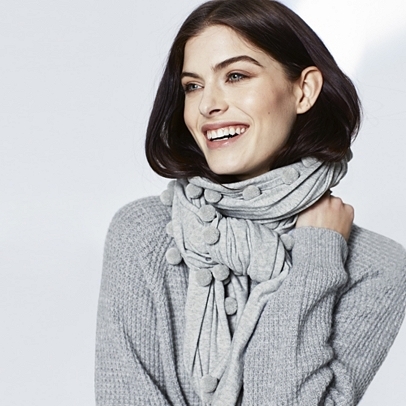 So ladies what are your thoughts on The White Company? Are you a fan? If so do you treat yourself to their clothing & home wear or do you prefer one collection over the other? Also what about their home fragrance ranges - is it a thumbs up from you? As usual I'd love to hear your thoughts. 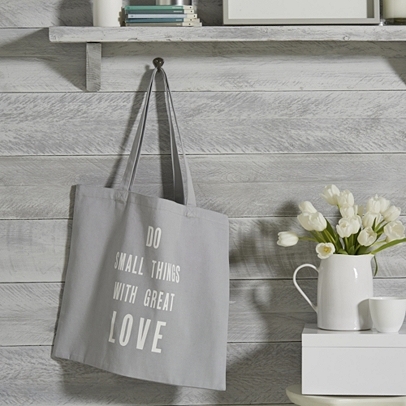 Right I'll be back in the morning but in the meantime don't forget there's 15% off everything at The White Company, simply click here & use code AN536 at checkout (code valid until 18th September 2016). I know I will certainly be investing in another candle or two! Plus of course it's the last day to get 25% off everything, simply click here & use code FRIEND16. Good call to promote TWC today, Jane, I'm a fan of the company and with that cosy top photo you may just have softened me to autumn. A bit. I do think they do super knitwear; I like their soft sludgey neutrals. I've been a fan of their modal tops and vests, which now feel a tad short for me. Just a tad, though, doesn't stop me wearing these lovely tops! I'm off to check the site to see if they have lengthened the tops this season. They just epitomise effortless chic don't they Mary & with 25% off that's a serious saving so perfect timing for treating ourselves ready for Autumn or even starting our Christmas shopping! Oh wow Caroline what a wonderful 1st birthday gift I love it & with the discount you definitely deserve the candle for being the most thoughtful Aunt ever! Enjoy. You can't beat Autumn & lighting a candle can you Natalie. I'm now a total convert to The White Company's candles & they're a much better price point than similar companies to! I'd certainly highly recommend.